After the thrills and spills of the opening three rounds of the 2001 season Formula 1 returned to Europe, and Italy of all places. The revitalizing atmosphere of Italy™s love for motor racing knocked aside any lingering hints of jet lag as the gorgeous girls who stand guard on the paddock gate welcomed all and sundry into San Marino. Bernie™s fleet of TV trucks was parked immaculately outside the cage whilst within the new motorhomes gleamed expensively. Behind their tinted windows intrigues were played out or dreamed up, depending upon whom you spoke to but on the circuit things began as business as usual. Friday dawned gray, heavy and damp as the Formula 1 brigade began to get down to the serious business of the day. The Arrows twins of Enrique Bernoldi and Jos Verstappen led the way out for the first installation laps but Verstappen only lasted as far as Tamburello before pulling off the circuit. As everyone else came out, quite literally dipped a toe in the water, and scurried back into their warm, dry garages to look into their computers it was left to Michael Schumacher to perform the first flying laps of the weekend. The Ferrari wailed around Imola quite unconcerned by the rest of the world, the few early starters among the Tifosi appreciating the gesture as they huddled about the circuit draped in soggy flags. Soon the proper running was underway and both Schumacher and team mate Barrichello splashed round in the 1m 38s bracket, something which nobody else could get within four seconds of for most of the opening hour. If there were any tremors of anxiety in the pit lane however they were well concealed “ Friday is a time to build strategies, choose compounds and talk about fuel loads, so everyone was hoping for the best. There was good reason for optimism at Sauber, whose Ferrari engined cars were best of the rest for much of the morning™s wet running as several runners explored the grass. Friday™s are a tough proposition for the teams as they work out their conundrums but with so little time back in Europe, European Minardi was having to work doubly hard. Without having the luxury of a dedicated test team they had to wait for everything to arrive back from South America and had just three days to prepare for their home race. To end the day off the bottom of the timesheets did them great credit, although Marques suffered a gearbox failure early in the day. It was not just the smaller teams left at a disadvantage however. McLaren, BAR and Jordan all tested at Silverstone, and while their rivals were making useful progress at Fiorano, Magny Cours and Jerez their week was a washout “ quite literally. Meanwhile at Williams Juan Pablo Montoya™s car sat idle for much of the day, having a third dose of Friday engine gremlins in four races. The team was resolutely upbeat, however “ highlighted by the ˜Keep Your Distance™ signs on the rear wings of its FW23s. œI just hope Rubens can read alright, said BMW™s Gerhard Berger, mischievously. In the afternoon the circuit dried out and so it was back to the drawing board for dry settings, compounds and fuel loads. Montoya would have to rely on the good offices of the Williams guru Sam Michael to translate what Ralf™s car was telling the team for the Colombian. Suitably the lap times tumbled, and for a while the teams were following one another two-by-two with the Ferraris ever out in front. As the saber rattling began in earnest however it was Ralf Schumacher who got closest to them, the only man to join the Marlboro cars in the 1m 25s bracket “ albeit half a second away from the second car of Rubens Barrichello. It was a right royal mix-up behind as the strategies were worked out. The McLaren of Mika Hakkinen was in fourth, but was over 1.2 seconds off the pace “ followed by the BAR of Panis, Sauber whippersnapper Kimi Raikkonen and Eddie Irvine™s Jaguar. It could be a dream grid for those looking for an eventful race, with David Coulthard eleventh and the Jordans all over the place but in reality it was watch and wait time. Saturday was another damp dawn, at which time several teams were putting the finishing touches to their rebuilt cars, among them David Coulthard. Evidently all was not well in some quarters even without the fog of Friday running to mask it, but with sums done and telemetry checked everyone was hoping that their charges were peaked and tweaked for Saturday™s happy hour. The opening session of qualifying morning was wet, which offered Schumacher and Ferrari an opportunity to depress everyone by going three seconds a lap quicker than everyone else. Everyone else was headed by Mika Hakkinen™s McLaren and tailed by Luciano Burti™s Jaguar, which slid into the wall at the Acque Minerale. As a host of drivers all took turns to pirouette at various places around the Autodromo, Mika came out and banged in a good lap to go fastest by three tenths of a second but it was still fairly academic. Soon both Ferraris were alone in the 1m 35s and behind there was more two-by-two from the teams. McLaren was alone in the 1m 36s with Hakkinen ahead of Coulthard, the Jordans had gathered themselves together to follow on with Heinz-Harald Frentzen ahead of Jarno Trulli, Raikkonen was ahead of Nick Heidfeld in a perky show from Sauber and the BARs rounded out the top ten with Olivier Panis holding his advantage over Jacques Villeneuve. The second session was drying and Ralf Schumacher immediately showed that, while weak in the wet, the Michelin-shod Williams is a match for anything in the dry by going on top with a 1m 32s. Brother Michael then stamped in a 1m 31s but Kimi Raikkonen was not far behind the sibling squabble as his strong form carried on. Briefly the other Ferrari engined car of Jean Alesi showed a bit of spice as well, but that can largely be put down to Jean™s car control and passion for Imola rather than the team™s search to regain its pre-season pace. As the circuit dried Alesi™s efforts went increasingly unrewarded which, on Michelin tires, is far from being a good sign. Before the qualifying hour the buzz was that Michael Schumacher had opted for the harder compound of Bridgestone. This was bemusing many “ not least McLaren, who had little enough indication from their work or from the tire supplier that this was the way to go. Cool temperatures, a loose track surface and common sense all pointed towards the stickiest tires available but with Ross Brawn and Co. one should expect the unexpected. So it was that as the qualifying hour began Michael was straight out there among the Arrows and Minardis to put in a banker lap beneath some broody-looking clouds. In the opening five minutes almost all the field followed suit, so when Michael went to the top with a 1m 27.000 and Juan Pablo Montoya followed him in on 1m 27.49s it looked quite impressive from the Williams, but then everyone else finished their laps and all hell broke loose on the timing screens as first Barrichello then Frentzen went to the top, Ralf Schumacher slotted in behind his brother and Montoya was suddenly ninth! The Ferraris opted for two flying laps in one gulp, as they are wont to do. Schumacher improved his first time by three quarters of a second but still stayed in fourth, while Barrichello popped up in P1 again with a 1m 25.038 despite almost tripping over his fellow Paulista, Luciano Burti. The second wave of runners were swiftly out of their garages and Mika Hakkinen went second, just a couple of tenths off Barrichello. He was followed by a big effort from Jacques Villeneuve involving a lot of skittering as he worked the pedals and some GBH on the curbing on his way to provisional third place as the ˜Lucky Tribe™ did a quick rain dance. As that call went unanswered the next salvo of quick times came in, including the second BAR of Olivier Panis, dropping Jacques to eighth. Villeneuve is clearly perturbed about his team mate and opinions currently differ from whether he is merely slightly distracted to being madder than Marlon Brando in Apocalypse Now, but it seems that the challenge of Panis is greater than that of all the 1997 world champion™s team mates combined. When one journalist asked JV how he felt to have been outqualified by his team mate again he got rather short, acidic shrift. His is nothing if not an indomitable soul however, and they are few who discount Jacques to spring surprises at any moment. David Coulthard managed to spring his own surprise to nail his name at the top of the timing screen with a 1m 25.014s, bringing further cheer to the McLaren and Mercedes men. Clearly both cars were up there on the pace for the first time this season, and the scene was being set for an enjoyable skirmish as Hakkinen went out and knocked a further eight tenths off provisional pole, the circuit getting faster all the time. Michael Schumacher then came out and imperiously took back the provisional pole, getting deep into the 1m 23s and as the circuit improved so too did the Williams pair, Montoya going P3 before Ralf Schumacher squeezed in front of him. Heinz-Harald Frentzen was set to join in the fun but found Tarso Marques ambling through the kinks at Villeneuve and remonstrated with him on the way round Tosa after what he described as a ˜hairy™ moment. Then came a lull in which Jean Alesi urged his Prost into 13th position, the team™s stated aim of a top 10 qualifying slot looking increasingly remote. The comparative calm lasted only so long, however, as Eddie Irvine ended his effort with an armful of opposite lock to go 12th and Frentzen recovered from his Marques moment to leap into fifth place. 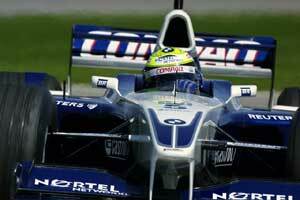 The Williams pair then sandwiched him, Ralf in front, and then Jacques Villeneuve deposed Montoya from fifth. Finally, with just a few minutes remaining and the rain having held off it was showtime. Frentzen was the first of the big boys to make his last run and it was a ragged affair, no improvement. Barrichello was next into the last chance saloon and he went third on 1m 23.736s, staying out for a second flier only to find Villeneuve™s BAR in his path, sparking a well-honed dose of Latin temperament. Out of nowhere Jarno Trulli burst into second place, then Coulthard surged round and took pole with 1m 23.054 in a classic, unruffled lap to get past Schumacher, and Hakkinen could only slot in behind. Michael Schumacher was out on the circuit and charging, but a lock of brakes and ragged recovery meant it was good but not good enough to go ahead of the McLarens, and to make matters worse brother Ralf then stonked round to steal third place in the dying seconds. The Ferrari men held their heads on the pit wall as the McLaren drivers secured the Tifosi™s worst nightmare. œI think I am happier starting on the second row on the right tires for tomorrow than be on pole on the wrong ones, said Michael ominously, but the McLaren boys were jubilant. Blue skies greeted Imola on Easter Sunday, and at every road junction chaos broke out between the faithful going to church and the equally faithful going to see what Michael Schumacher could do about McLaren. In warm up it seemed precious little on outright pace. The top three in qualifying however remained the top three on Sunday morning, with Michael sixth behind his team mate and Sauber™s Nick Heidfeld. With Ferrari on the hard Bridgestones it looked like it was going to be a single stop race for them in an effort to make it past the McLarens and defend from the Williams and Jordan threat from inside the pit lane. The massed ranks of the Tifosi made it back from church in time to enjoy the sunshine and look expectantly towards their men as the grid formed up for 62 laps of intrigue. As the lights went on one by one David Coulthard™s McLaren threatened to jump the start, and when they went out he got bogged down with wheelspin in an uncharacteristically wobbly getaway. This allowed Ralf Schumacher to convert a good start into a great one, the Williams slicing by both the McLarens on the inside of the run down to Tamburello and, even having dropped a couple of wheels on the grass, drove straight into the lead. Jarno Trulli followed Schumacher™s route through from fifth into a surprised and surprising third place as Hakkinen dawdled momentarily. Olivier Panis elected to jink to the outside of the straight and made some profit there too, his BAR vaulting past an almost stationary Barrichello and Juan Pablo Montoya before tucking in behind Michael Schumacher, who was languishing in fifth as the field settled itself down through Villeneuve and Tosa. Montoya, though, was as keen as ever to get himself up towards the business end of things and as the leaders made their way through the final Variante Bassa chicane he lunged up inside Panis and took sixth place. Out in front Coulthard was tracking Schumacher™s Williams happily enough, less than a second in arrears, and both were pulling away from Trulli, behind whom a queue was beginning to form. In that queue however Schumi the elder appeared to be wrestling with his Ferrari and as he put the power down out of the Variante Bassa for the third time both Montoya and Panis simply drove past him under acceleration. The Ferrari then got a little more willful and ran wide through Tosa, allowing Barrichello to slip inside to head the hometown heroes™ charge. In seventh and eighth place respectively however that charge did not look altogether threatening. Indeed the Ferraris appeared to have come over all nostalgic for the days of about a decade ago and one half expected to see the grandstands emptying pretty swiftly unless forward progress was delivered. The Tifosi know well enough the ways of their modern day idols however and stayed put, no doubt praying that Ross Brawn had got something fairly spectacular up his sleeve when it came to pit strategy. The leading pair continued to pull away from Trulli and Hakkinen at a rate of knots, but Ralf was beginning to stretch his lead, both cars putting in fastest laps through the opening segment but on balance Ralf coming out on top. Far, far behind them Alonso™s Minardi became the first retirement on the sixth lap when chronic handling problems sent him off into the barriers at the Variante Alta as he gave chase to Jenson Button. Jenson himself was having another bad day at the office, for although he blasted out of 21st place on the grid with as much disdain as he could muster it was only enough to put himself 19th. Renault must be getting tired of saying that it™s looking forward to the future, especially when its drivers are looking forward at an Arrows. Fisichella was faring slightly better, looking forward at Jean Alesi™s Prost in 15th place, but he was forced out after 31 laps with a misfire while Jenson was in and out of the pits in an extended trundle that took him to 12th place at the close “ or last and two laps down. On the seventh lap the retirement list doubled in size when Jos Verstappen pulled over at the Rivazza, his engine having cooked itself. This left him in a good position to spectate when, a couple of laps later, Barrichello made a quick, clean move on Panis, whose BAR™s handling was going awry and beginning to have trouble selecting gear. A lap later Schumacher repeated his teammate™s move to the inch, the wounded Ferrari giving some kind of idea as to how rough a time Panis was having. Nothing, it seemed, was going to go Ferrari™s way on home soil, a fact drilled home by McLaren and Williams whose lead drivers were extending their advantage. Both Coulthard and Schumacher traded tenths and fastest laps, the gap between them never wavering too far from two seconds. Coulthard looked threatening, but as the pit stops approached he was feeling slightly less confident that Ralf could be beaten. Kimi Raikkonen™s sterling weekend™s work for Sauber had already come to an early end at this stage when, having been worrying away at the Ferrari pair, the steering wheel came off in his hands accelerating out of Tosa on lap 18 and he was fortunate indeed to have been there rather than somewhere less accident-friendly. His team mate Nick Heidfeld plugged round to a seventh place finish. The gaps between everyone in the field were by then fairly stable, with Hakkinen frustratedly sitting on the tail of Trulli™s Jordan with scant chance to get by and stretch his legs, and Montoya keeping himself between the Finn and the Ferraris. On lap 23 that became a singular Ferrari, as Michael Schumacher slowed dramatically, his left front tire flat. He crawled round to the pits and emerged in 13th place but something was very amiss and he was 15th by the time he got back round and pulled straight into his garage. Perhaps the secret new cooling system that had been kept, quite literally, under wraps all weekend still needed a bit of work. Whatever, he was out before the first round of pit stops, of which team mate Barrichello made his last of all the front runners to gain places on Hakkinen, Montoya and Trulli in that order. Hakkinen finally got by the Jordan in the pits but Montoya provided a much-needed dose of excitement on lap 29. He caught up with Trulli going into Tamburello and, unlike Hakkinen, was in no mood to be thwarted by the Italian. Montoya hung his Williams out round the outside into the chicane, keeping everything together to hold the inside line and bustled away in search of his first points finish. It was not to be however, for his second pit stop he lost all gears and was over a minute getting back into the race and that was in first gear only, leaving him a slow and noisy limp round into retirement. For his team mate however it was a much more satisfying day. With David Coulthard™s second set of Bridgestones performing well below par, Ralf was able to stretch his advantage to around ten seconds, depending on the traffic. The race became fairly static throughout and the laps wound down after the second round of stops with Coulthard - invigorated by better Bridgestones - pressing on but not enough to worry the German. It™s hard to think of Ralf Schumacher as an old stager, but in his fifth season in Formula 1 that was exactly the sort of performance he put in. Like a seasoned pro he held off Coulthard™s advances to the end, using that advantage stolen at the start and the McLaren™s tire disadvantage to control the race superbly. It was about as diplomatic as Ralf gets, which goes some way to show what victory meant to him, and deservedly so too. If victorious ways seem a long time ago to Ralf, it must seem like an age to the team, and the taste will be all the sweeter for knowing that it came before they felt the car was truly ready. Even Ron Dennis was happy, as he was entitled to be with one driver now sharing the top of the points standings. œWe hate to lose, he said, œbut if we have to, we prefer that it™s to our good friends and competitors at Williams. Will Ferrari ever have some scores to settle in Catalunya.